I’m always amazed that more people don’t know the little tricks you can use to get more out of a simple Google (s goog) search. Here are 10 of my favorites. Use Google as a spelling aid. As Rob Hacker — the WWD reader I profiled last week — pointed out, entering a word into Google is a quick way to see if you have the right spelling. If it’s incorrect, Google will suggest the correct spelling instead. Additionally, if you want to get a definition of a word, you can use the “define:” operator to return definitions from various dictionaries (for example, define: parasympathetic). Get quick currency conversions. Google can also do currency conversion, for example: 100 pounds in dollars. If you would like to convert minor currencies, be sure to be specific about the country. So, if you want to find out how many nuevos soles your dollars might buy, you could try: 100 dollars in Peruvian nuevos soles. What are your favorite Google search tricks? i always check the weather for today or the next five days…just type in “weather”! Ha, I didn’t know about that one, thanks Jeremy! My favorite trick is to us Google Advanced Search. 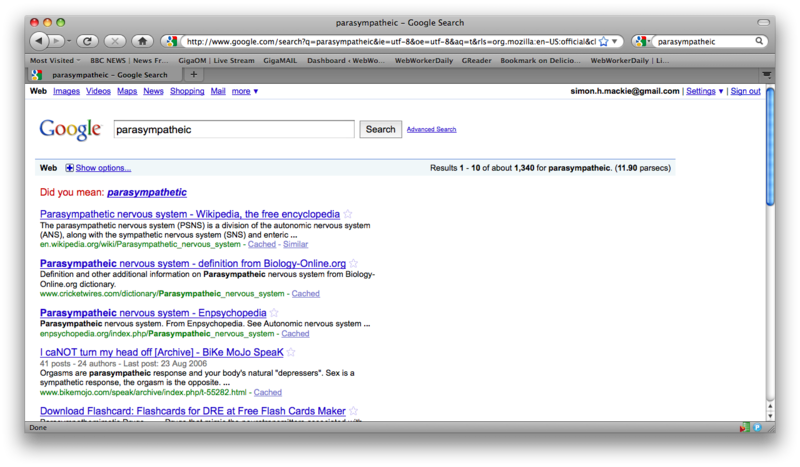 My second favorite trick is to use Google books search (books.google.com). Keep in mind that all of the above tricks work for Bing.com, too. My favorite one (not listed here?) 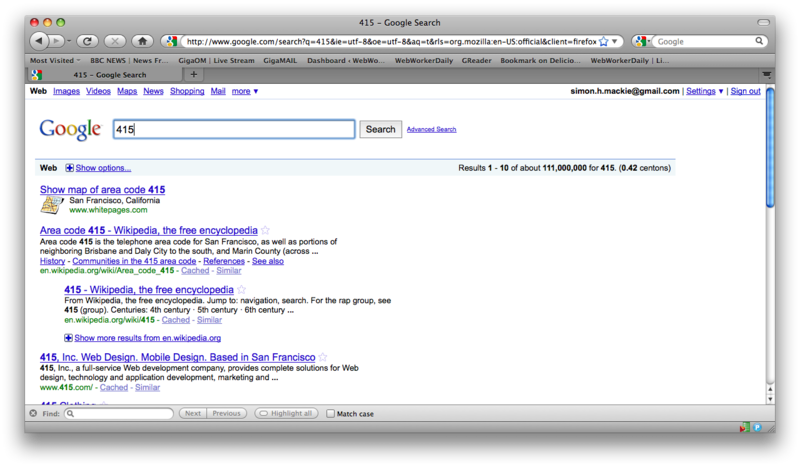 is the “I’m Feeling Lucky” button on the main Google page, which sends you to the page of the first search result. Not sure how to do this anywhere else except the official Google page, though. Type “Movies in City name” without quotes and replace “City Name” with actual City Name and you will get the list of Movies and theaters with the show timings, ratings and reviews. Same is with book search. You could search a book from ISBN number “ISBN xiiixixixixi-0” Google has a huge database of books in books.google.com and it would fetch the book with price, readers review a preview (depends on permission granted by publisher or author of book) of the book also. Nice tips, some I knew and used, other don’t. Thanks there are some great tips can anyone recommend the search terms for. I want to do a search for the above but it keeps throwing up some strange results. Your trick #2 does not work, for the reason that spelling and grammar is not a democracy. So some words are incorrectly spelled, by the majority. When you use google, you will replicate this behaviour more. When the spelling doesnâ€™t matter, why check? If it does, use a proper site! Prove it. Give an example of a word in the English language which has been so misspelled that even Google can not get it correct; however, do not confuse the search help feature with actual search results. The search help feature, which remembers the most commonly searched phrases (including misspellings) and offers these as suggestions as to what you might be searching, is not the same thing as the actual results to which the author was referring. The actual search results ignores the misspellings of all of the previous search attempts and relies solely on the results of the web search database and references to online dictionaries. Thanks for these amazing tips – will definitely be putting them to good use. “100 dollars in peruvian nuevos soles” seems to work just fine. Thanks for the update. I tried “dollars in nuevos soles” which doesn’t work — obviously I should have been more specific. Thanks for this! Super handy and most of these I haven’t ever used. sorry for my ignorance … is there a Google tools/terms glossary or reference page? Thanks! I find the “filetype:” command very helpful, especially when looking for in-depth information, I almost exclusively use “search term filetype:pdf”. You can do quick tracking of flights. e.g. SWA 174. Is there a way to search in the last one day or some specific time. I know, it can be done through the UI through the options but through a text query is it possible?? You can do conversions with more than just currencies. The only thing I haven’t figure out is how to do date math like: What date is 30 days after November 15th? It’s not perfect, but Wolfram Alpha ( http://www.wolframalpha.com/ ) will kind of answer your “30 days after November 15” question – it somehow thinks the question is related to the stock market, but it does give the right answer. It’s built more as a knowledge engine rather than a search engine, so it can generally handle this kind of thing better than Google. I would like to find also nice search “strategies”. For istance looking for info regarding a deasease, or a business model, or a trend, or a scientific method, ecc… could be done both using naif terms to define it or with the proper terms. The first will provide you “naif” info and website, the second will provide you “technical” info and website. For example: searching “organize documents in a website” will not provide as many technical resources and info as searching “card sorting”. The first will direct you to general web site with easy to understand resources, the second will direct you to interesting website with specific resources. That’s why you shouldn’t search directly to the info you need, but first you should make 3-4 searches looking to the “right keywords” you need, especially when you search something that could be an accademic field of study. <— This is an example of “strategy” and I would lke to read more of these; you don’t need to be an expert, because everybody of us has their own strategies; we should just share them more. For #2, I suggest using the define: operator. If you type “define:nuisance” into Google, for example, you get definitions of the word ‘nuisance’ from various Internet sources; if you misspell a word, say by typing “define:noisance”, you get a suggestion for the right spelling (“Did you mean: nuisance?”). Also, an addendum to #5: Google can convert all sorts of figures and values for you, not just currency. Try entering “12 miles in kilometers” or “10 years in minutes“. It doesn’t work for everything, though…at least, not yet. I did note the “define:” operator in point 2, but it’s under the image so perhaps you missed it. Your #2 only mentions define: as a way to get the definition. Your “spelling” suggestion was to enter the word and let Google suggest a correctly spelled alternative. Oh? Enter “alot” and see whether Google correctly apprehends that you’re an illiterate idiot in need of spelling help. There are other similar malapropisms being perpetuated all over the web. Anyone serious about spelling should ALWAYS use define: or, better still, consult a dictionary (digital or paper). Thanks – I knew about most of these, but hadn’t seen the one about time before. I’ll be using that one a lot! USPS, UPS & Fedex tracking codes can be entered to get updates from their real time APIs about what city the package is in or if it is sitting on your doorstep. I just tested it again with Fedex and have done the others in the past. Regarding tip #4, it works even better if you type “time in” followed by a location. For instance, when typing “time in san francisco” it will actually show you the time in the suggestion dropdown…you don’t even have to hit enter. Your trick #2 does not work, for the reason that spelling and grammar is not a democracy. So some words are incorrectly spelled, by the majority. When you use google, you will replicate this behaviour more. When the spelling doesn’t matter, why check? If it does, use a proper site! It does, because google will know the correct word not because of the majority, but because of the huge r&d of google linguistics. So they basically know the correct word plus the common mistakes to provide you with a corrected version of your input. So they are not suggesting you the way most people on the web write it. Nice! I knew about and have used all except number 9. I’m always using these operators to tweek searchs. It’s so very powerful. You can also use the site: operator for some pretty amazing Twitter search results. very cool! I just tried it. I will remember this one. Thanks, Erin! Drag it to your bookmarks bar, give it a name, and give it a try. For some reason, which I will endeavour to discover, this is not now working. Joan, it worked after replacing the characters that are at the moment with normal apostrophes ie ‘ . The second parameter on the prompt() should be 2 apostrophe, not a double quote. Nice trick though.